Use BlueNote Communicator to improve your business operations – and improve customer service. An incoming SMS can depending on content automatically trigger further processing. Inform your customers with fast and reliable SMS. Let SMS text messaging be an integrated part of your business communication. BlueNote is fully scalable and can handle as much as 40 SMS per second. SMS is easy, fast and reliable. SMS can now be integrated in the communication flow for various businesses. You can both send SMS from and receive SMS on your IBMi™. Fully scalable - send as much as 40 SMS per second. SMS messages can be sent manually or automatically. An API set ensures that the system can be fully integrated to your program. 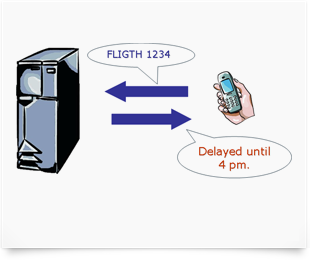 An incoming SMS can, all depending on the content, launch an application or serve a 'trigger' for a program that returns a response to the sender. SMS or text messaging can be an integrated part of your business communication. BlueNote SMS Communicator can both send from - and receive SMS messages on IBM i™. Messages can be sent manually or automatically from your applications. The incoming SMS can be read and handled manually - or it can activate an automatic process on the IBM i™. It could be an automated answer e.g. status on stock, a reservation, or enable printout of an invoice. BlueNote SMS Communicator can send / receive up to 1350 characters in one message. The product is fully scalable and can handle up to 6,000,000 SMS per months. The Web client (included) provides an overview on all the incoming and outgoing SMS traffic.